Reports and forms (invoice layouts etc) are provided as plug-ins, allowing you to share ones you have created with other users. To be seen by MoneyWorks they must be stored in the correct location (MoneyWorks will normally manage all this for you). 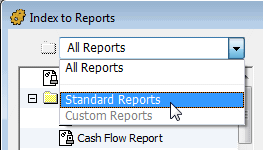 Standard Reports and Forms supplied as part of MoneyWorks reside in the MoneyWorks 8 Standard Plug-ins folder1. This is automatically made for you when you install MoneyWorks. Note: It is important not to put forms/reports that you create into the Standard Plug-ins folder as MoneyWorks may over-write this when new versions are released. This will destroy the existing contents. Note: The Custom Plug-ins folder contains four sub-folders, for holding Reports, Forms, Scripts and Import Maps. To locate the folder, click on the link in the Data section of the Housekeeping Navigator panel or use Reports>Index to Reports. If you delete the standard plug-ins folder, MoneyWorks will recreate it. If you update the MoneyWorks software, MoneyWorks may overwrite any of the standard plugins files with new versions without warning (so if you change any of these files the changes should be saved in Custom plugins). If you do not want MoneyWorks to recreate the contents of the standard plugins folder, you may place an empty file at the top level of the Standard Plug-Ins folder called "No Standard Plugins". If MoneyWorks sees this it will not recreate standard plugins, even after a software update. The location of this varies, depending on whether you are hosting MoneyWorks on your computer, or are connecting to another machine using Gold or Datacentre. To locate the folder for the currently open document, click on the link in the Data section of the Housekeeping Navigator panel or use Reports>Index to Reports. where <datacentre_name> is the name of the Datacentre server as set in its configuration page, and <subfolders> is the subfolder hierarchy (if any) that the document resides in within the Datacentre document root folder on the server. This is only present if there is no custom plug-ins folder for the currently open file. Note: MoneyWorks will automatically create the MoneyWorks Custom Plug-ins folder for you the first time you need it (e.g. saving a custom report or form). The selected folder will be revealed in the Finder (Mac) or Windows Explorer. Confirmation will be requested. If you delete your local Datacentre Custom Plug-ins folder, a new copy will be downloaded from the Datacentre server the next time you connect.